We can be lesbians in Würzburg. This morning was all about buns. Grandma would be so proud. (“Buns!” heehee, that makes Kristin think of Dylan) We ate so much at our hostel breakfast this morning. It was a little ridiculous but Justine ate 2 buns…and then grabbed one for the walk to the station…and packed another in her lunch. Kristin only had one at breakfast, but did take a road and a lunch bun too. So many carbs! As a side note, we noticed a sign above the breakfast buffet this morning saying you weren’t allowed to pack lunches from the continental breakfast, but we are rebels and did it anyway. 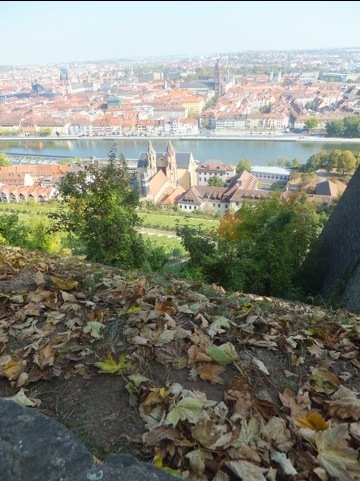 Like our 2 buns and little bit of fruit will bankrupt them… We then hopped othe train and took an hour ride into Würzburg. We took a silly but useful street tram, to our hostel. It is a Hosteling International hostel, which means it will be nice 🙂 We’ve stayed in HI hostels in Luxembourg, Rothenburg and all of the YHA hostels in the UK and they are always really great…although not always the cheapest. We weren’t able to check in yet but we did get a detailed city map that showed us everything to do here. We sat down with a pen and circled everything interesting and then decided on a plan of attack. 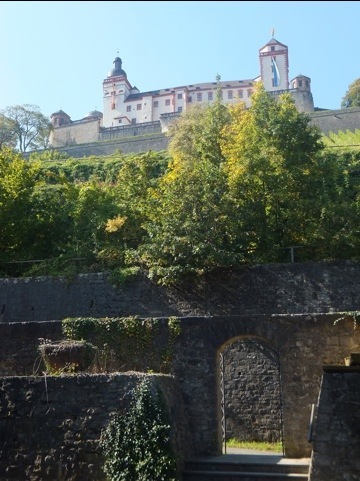 Our first destination was the one we definitely wanted to get to: the Fortress Marienberg. This sits up on a hill (as most fortresses do) just behind our hostel. The path up was a 30 minute hike along the Wine Trail. Don’t get too excited, we didn’t get any to drink. The path winds through some grape growing areas of a local vineyard. It was very sunny but we pushed through. It was best to focus on the view rather than how hot it was. The closer we got to the castle, the more of the city that revealed itself to us. The city sprawl is mainly dominated by red roofed houses and church spires. In general, the city looks very old. You never would guess that it was almost completely leveled by bombing in WWII. It wasn’t until 1970 that the city was fully rebuilt. 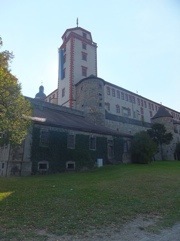 The construction of Fortress Marienberg began around 1200, and the moat can still be traced back to that era. After 1600 if was remodeled into a Renaissance castle. Previous inhabitants include the Prince Bishops…whatever those are…? During the second world war almost 40% of the fortress was destroyed but which, when you think about it, is pretty good when the city itself saw a destruction rate of about 90%. We didn’t feel an overwhelming need to go into the museums so we just wandered around the castle walls and courtyards (that was free!). This Palace is a UNESCO World Heritage Site. That’s another oneto check off the list. 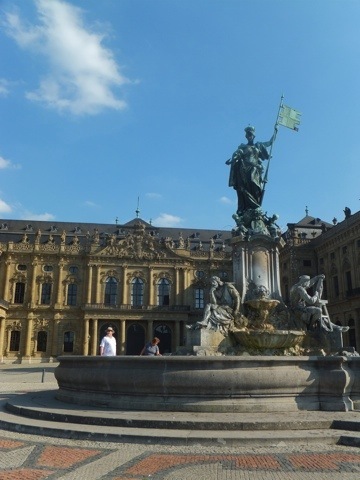 It was pretty much completely destroyed in the war, but rebuilt as an exact replica of the old one…so it’s a fake old building…. 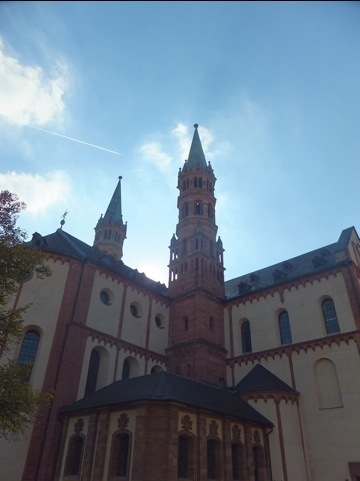 The Neumünster is a romanesque basilica fro the 11th century. The Dom St. Kilian is the 4th largest Romanesque cathedral in Germany. They sit right next door to each other on the grave of St. Kilian. Otherwise we just wandered the city taking in the sunshine and quaint feel of this rather sprawling place. We also found several nice places to sit and people watch. Basically we were pretty chill until dinner time. For supper we were itching for some more traditional German grub so we decided on a place on a random side street where the waitresses were dressed like they were at Oktoberfest (aka in traditional German garb). We wrangled ourselves some schnitzel and späzel. Tonight’s schnitzel choice was called Jägerschnitzel and came with a yummy yummy mushroom sauce with plenty of little mushrooms in it. 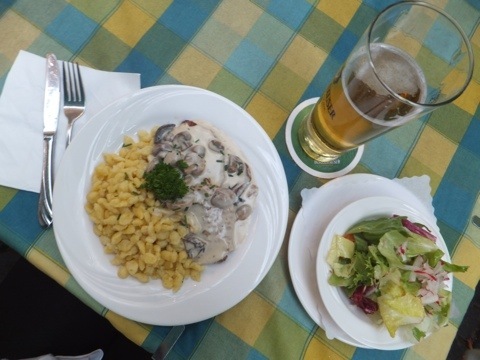 It was so good because, really, who doesn’t like mushroom sauce?…except maybe Dylan, seeing as it may kill him… The spätzel was also incredibly delicious. Justine was excited to get some as she already knew she like it. Her and her daddy had made spätzel at home before…although theirs was in thick french fry length noodles, while here we seem to get it in small kidney bean sized oblong balls. We would like to note that we were at the restaurant for 1 hour and 40 minutes tonight. This is a big deal for us! If you know Kristin at all you will have realized she is a speed eater, and Justine usually doesn’t finish too far behind her. We have been working on slowing down and savoring the flavors, as the Europeans do, and having real conversation during dinner. And tonight was a big step for us! Yay!!!!!!!! Love, Luck & Lots of Sun!